Lego Dimensions week on Tired Old Hack finally concludes with a review of the recently released Ghostbusters level pack. Be sure to catch up if you missed out on the Simpsons, Back To The Future, Portal 2 or Doctor Who level pack reviews. 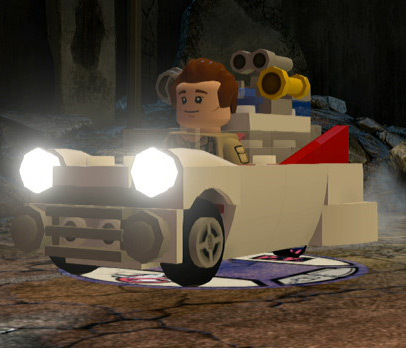 Not content with ensuring ’80s movie fans were catered for in Lego Dimensions with a Back To The Future level pack, Traveller’s Tales has gone one further with a level pack based on Ghostbusters. It’s a timely move, given the popularity of the previously released Ecto-1 Lego set and the all-female Ghostbusters reboot due in cinemas later this year. Does this extra level scratch the Ghostbusting itch for fans of the original movies, though? You bet your PKE meter it does. As with the Simpsons and Back To The Future level packs, the new Ghostbusters stage (simply entitled Ghostbusters) is a retelling of an existing story, in this case the first movie. However, unlike the other level packs – which each feature 3-4 sections to play through – the Ghostbusters level offers a hefty eight different sections, covering a wide range of scenes from the film. After a brief cut-scene aping the opening library sequence from the movie, the level starts at Ghostbusters HQ, where you have to find out how to open your fellow Ghostbusters’ lockers and get them suited up for some busting. After this you get to put together Ecto-1 and then you’re off to the second section. Here the Ghostbusters have to exorcise the Sedgewick Hotel, by taking out Slimer and the other ghosts that inhabit it. This is your first chance to use the ghost trap, but more on that later. After clearing out the hotel you take to the streets, where you find more ghosts that have to be trapped. You then make your way back to Ghostbusters HQ where you have to solve a puzzle to build the containment unit that holds your captured ghosts. Anyone who’s seen the film knows what happens next: with the ghosts released and New York swarming with spectres, you head out into the streets again, busting various ghosts until you reach the centre of the storm: Dana’s apartment block. Next you have to fight your way through the apartment block’s hallways, taking out more ghosts, until you finally reach the rooftop for not one, but two boss battles: Gozer and the Stay-Puft Marshmallow Man. Oooft. 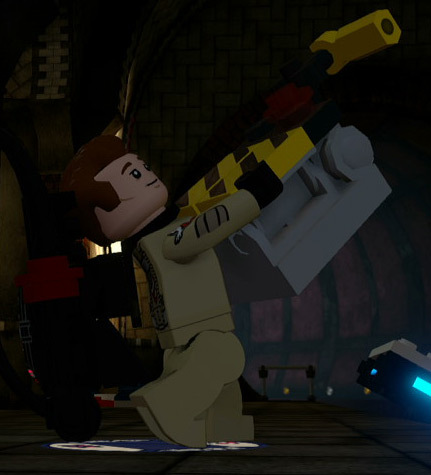 It probably goes without saying then but this Ghostbusters level is easily one of the longest you’ll play through in Lego Dimensions. The whole thing is just filled with daft bits that recreate iconic Ghostbusters moments in a Lego style, from the joke that the Lego Ecto-1 only fits one Ghostbuster (in cutscenes, the others run behind it with a wheelbarrow), to Stay-Puft’s eventual demise resulting in massive white Lego bricks falling from the sky instead of big marshmallow blobs. If you’re a fan of Ghostbusters, you’ll love the attention to detail in this one. 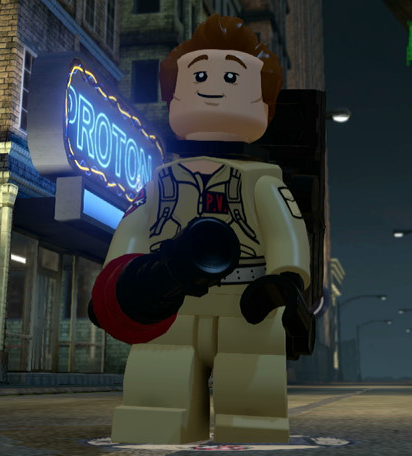 I’d been eagerly awaiting the Ghostbusters level pack for a number of reasons: not just because I’m a huge Ghostbusters fan and have been praying for a Lego Ghostbusters game for years, but because of the bloody ghosts. You see, some of Lego Dimensions’ Adventure Worlds have collectible gold bricks that are blocked off by ghosts. And Peter Venkman is the only character in the game who can get rid of them. His Proton Pack device can be fired at ghosts and used to drag them, Luigi’s Manision style, into his Ghost Trap gadget, finally letting me bump them off and get those lovely gold bricks. The Proton Pack also doubles as an effective laser, making it effortless to destroy large areas filled with scenery or enemies (as well as being able to destroy gold obstacles like other lasers can). There’s another lovely wee treat you may not be aware of though. Finish the level and you unlock the ability to switch Venkman out for any of the other three Ghostbusters whenever you like, each with their own dialogue and animations. The only minor drawback is that all four characters are voiced by archive audio, though Venkman’s is used in the cleverest way in that it’s used to make it sound like he’s interacting with other characters. Put him next to Batman and Venkman will say “you’re always concerned about your reputation,” a line from the movie. 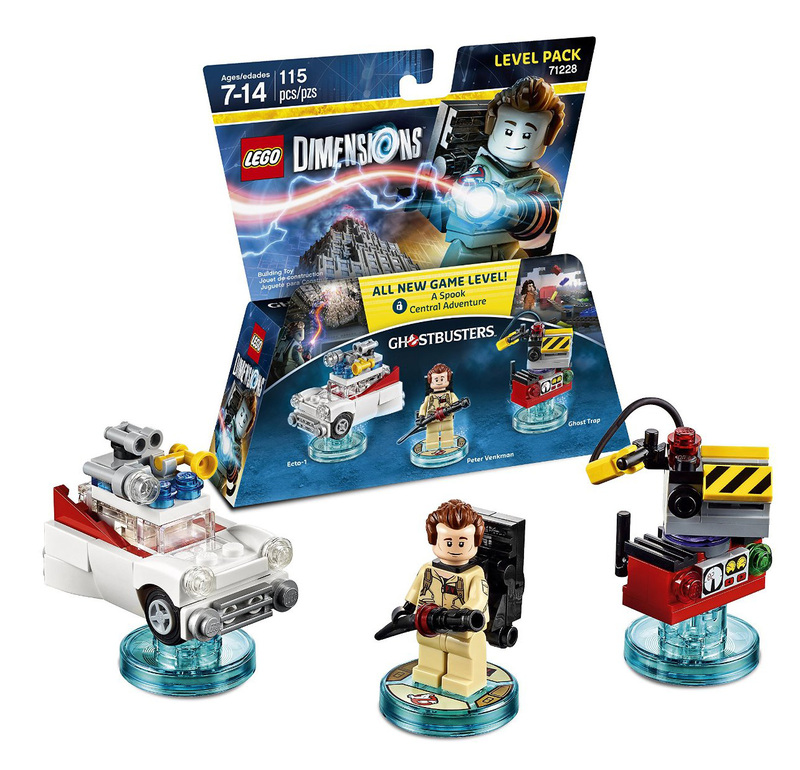 As with all other level packs, the Ghostbusters pack also comes with two vehicles/gadgets. Of course, the first had to be the iconic car from the movie. The build itself is an interesting one in that it only has two wheels: the back wheels look like they’re hidden by the white bodywork but they actually aren’t there. It’s not a big deal, but if you’ve got a kid who may like taking the microbuilds off their bases to play with them bear in mind it doesn’t roll well. In-game, the Ecto-1 is a fairly standard vehicle in its original form. It doesn’t have any special abilities, though it does come with the added awesomeness of being able to turn its trademark wailing siren on and off. Venkman’s Proton Pack weapon is all well and good when it comes to stunning ghosts and dragging them around, but without a place to put them it’s all a bit pointless. Outside of the Ghostbusters level this renders it pretty useless in its standard form: without ghosts it can’t trap anyone. 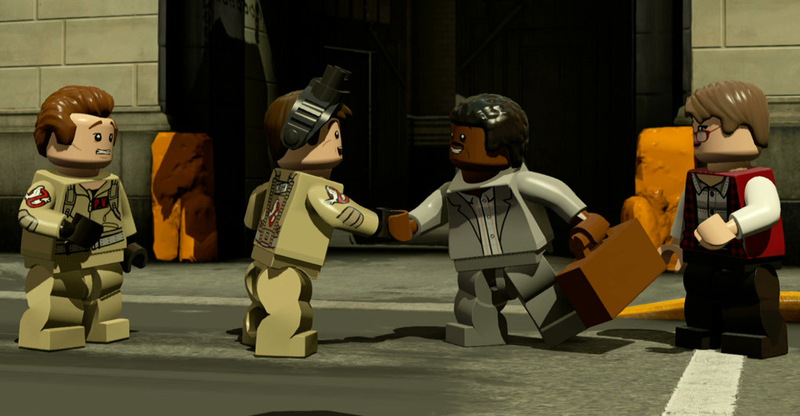 As clichéd as it sounds, the Ghostbusters level pack is best suited to fans of the original movie. The lengthy stage (expect to take around an hour to beat it without going for collectibles) is full of hilarious recreations of the source material and its two boss battles are fun too. Peter Venkman’s Proton Pack makes him a beast of a character to play as, and while the Ecto-1 isn’t exactly packed with abilities it’s the Ecto-1 so fair play to it. The only real dull point is the Ghost Trap: while there would understandably have been protests from fans had it not been the second included gadget, its sole ability is just too limited to make it truly useful. Still, that aside, this is one that Ghostbusters fans with the game really shouldn’t miss. Now, who do I have to contact to request a Statue Of Liberty vehicle for a future wave? If you want to buy the Lego Dimensions Ghostbusters Level Pack and fancy doing it through Amazon, please do it using this link: Amazon UK. It won’t cost you any extra and a cut of the profits will go to me, letting me invest back into improving the site.